When you’re designing a glazed structure, or even adding glazing on rooftops and over doorways, it’s important to know that your glazing will meet building codes and enhance the environment for people. The successfully designed glazed structure will meet code requirements while providing a wonderful daylighting feature. Don’t just download random specs, ask your glazing contractor the questions that count! How is the glazing going to drain? There is nothing worse than leaks or condensation with glass. It’s important that the structure is set up to drain properly. 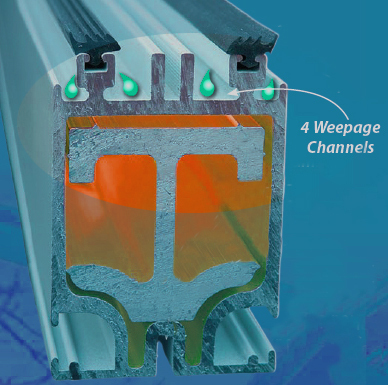 Extrusions often have to be drilled for weepage to exit after installation. But that doesn’t have to be the case. Check with your glazing contractor to see if there is a weepage channel built into the extrusion and how the drainage will be channeled away from the building. While daylighting is great for generating LEED credits, too much sun or sunlight directed in the wrong places is detrimental. Artwork, wood flooring and furniture fabric are just some of the things sunlight can really fade out. There is also a problem with glare in offices and classrooms where people are trying to work. Find out what options you have for cutting UV and intensity with UV blocking glass or sunshades. Different glazed structure widths and spans each require a different type of extrusion to handle the expansion. And where the glass will be placed often requires lamination, tempering, double panes or all of these things. Some structures are required to withstand salty water spray (by the shores for example) and others require a special level of safety or fire resistance (schools for example). Check your local codes and confirm that all standards can and will be met. It’s often the case that structural codes for residences differs than those for commercial purposes. But it’s also frequently the case that glazed structures are omitted from such differences, only meeting residential standards. If you’re planning a greenhouse, solarium or skylight for a school, senior living center or office you’ll want to be sure that the glazing meets the same standards that are required for the rest of the building. Will the glazing hold large amounts of snow? Can it withstand high wind? If not, find a company that can provide the same code levels that are required for the rest of the structure. By thoroughly reviewing the above key elements, you’ll be sure you’ve chosen the right glazing contractor for your new project. Just those few quick questions will assure your structure will last for years to come.